The first is a checkbox, checking this checkbox enables the textarea below it. Un-checking the checkbox disables the textarea below it. I'm looking for a suitable way to indicate to the user that the textarea will not be submitted as part of the form, even if they have filled information out and unchecked the first field. Currently the textarea when disabled is a greyed out state. My intention is to keep this form as brief as possible without being confusing for the user. Why not try to hide the text area when you click the disable button instead of greying it out? I've tried this approach in a long web form interface and hiding the unused or optional fields works great. When the textarea is gone the mental model of the user should be that no information is submitted because the form is not visible. "No information will be submited from this field". I agree with Andrew about check and uncheck. However, instead of checking and un-checking the elements; use show and hide method, which means, when user checks the checkbox; show the textarea or else hide it. 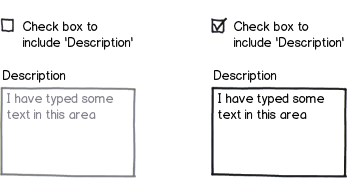 The behavior will directly inform the user that to enable textarea he/she has to check the checkbox first. It's called progressive disclosure. Keep the behavior as you describe it, but when the user un-checks the checkbox clear any text entered in the field and then disable it. When the checkbox is checked again the cleared text will be fetched back to the text area. This will save the work of the user when the checkbox is un-checked by mistake. Why do you need the check box at all? If someone wouldn't want the contents of the text area to be submitted, why would they write something there in the first place? Unless the text area is prefilled by default, I think you could probably do without the check box. Instead, you could write the purpose of the text area in gray right into the area, perhaps ending in "(optional)". That purpose text should not be transmitted, of course.